Paco Alcacer completed a loan move from Barcelona to Borussia Dortmund late in the summer transfer window. At the time many had doubts. Why did Die Schwarzgelben want a player who had struggled during his time at Camp Nou? At present, though, the Spain international is shutting down critics in the best way possible. Alcacer joined Barca in 2016 for around £26 million. In doing so, he took on an improbable task in trying to oust Luis Suarez as Blaugrana's number one striker. The Uruguayan will remain such until leaving. The former Valencia frontman realised that but had enough belief in own ability to prove credentials as the long-term replacement. Having made the step up, he took a while to find feet. His ten La Liga goals in two seasons didn't represent value for money. There's no doubt Alcacer has talent. He showed it at Valencia. His route took him through the youth system and B team before making senior debut in 2010. Six years later, the Torrent-born forward left Los Che having scored 43 times in 124 competitive games. He was arguably Spain's first-choice striker, too, a position since lost due to Barcelona form. Since moving to Germany, Alcacer hasn't featured much. However, it hasn't stopped him making an impact. 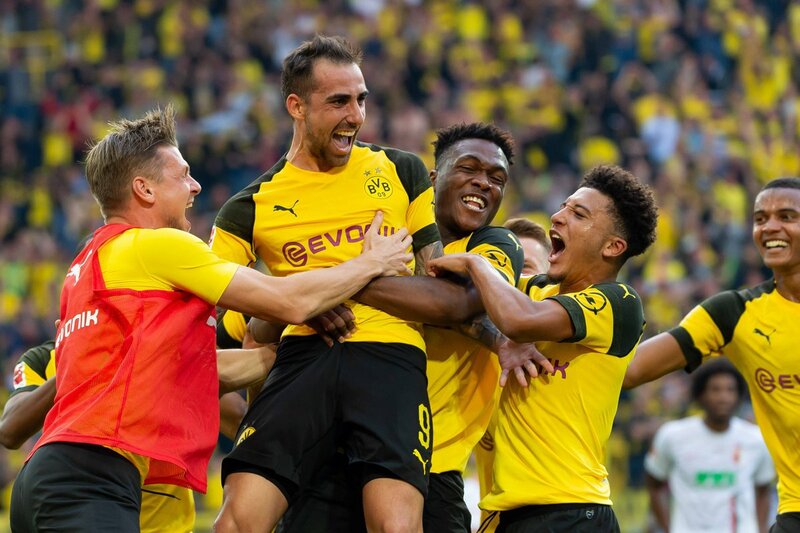 After missing Dortmund's third Bundesliga match through injury, he came on for 23 minutes in a 3-1 win over Eintracht Frankfurt, scoring the third goal. Alcacer was injured for the next game before being an unused substitute as BVB hit seven past Nurnberg. Since then, he has been a revelation. Coming off the bench with his side 2-0 down to Bayer Leverkusen, the 25-year-old scored twice in the last five minutes to turn the match and secure a 4-2 victory. In midweek, he played his first 90 minutes, marking it with a goal to help dispatch Monaco, 3-0, in the Champions League. Alcacer's performance against Monaco wasn't enough to earn a start on Saturday, yet he was a super sub once again. Entering the fray with Dortmund a goal down to Augsburg, his brace restored parity Then, with 96 minutes on the clock and the score at 3-3, he struck a free kick over the wall to win the game. Alcacer's form has earned a Spain recall under Luis Enrique, a manager who signed him for Barcelona. On current performance, the forward is a great addition to La Roja. He will hope to increase his record of six goals from 13 caps in a friendly against Wales on Thursday night. His next chance will arrive only four days later when hosting England in the UEFA Nations League. Alcacer possesses all the attributes needed to succeed as a modern-day striker. Although not physically imposing, he has a touch of pace along with good movement. Arguably, his biggest strength is an ability to create space. He doesn't overplay the ball, instead opting to get a shot away as quickly as possible. Alcacer has already stated an interest in extending his BVB stay for longer than the loan spell. There are still eight months to go before making any final decision, though. With Suarez now 31, the Spaniard may decide his future lies at Barca should current form continue. For now, Alcacer must concentrate on this campaign at Dortmund. Having scored six goals in 81 Bundesliga minutes, all eyes are on him as he aims to finally live up to early promise.